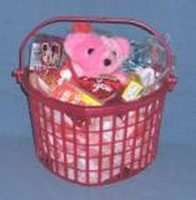 Valentine heart gift basket makes a great Valentine's Day gift for kids and adults. You get an assortment of Valentine's Day candy, nostalgic candy and a plush toy. For the chocolate lover you will get foil wrapped chocolate hearts, conversation hearts and Hershey kisses; as well as some nostalgic favorites. Candy bracelet , wax lips, red hots and more. This cute heart shaped basket is the perfect way to say I love you delivered right to your door. Color of basket and style of plush toy may vary.